Decommissioning of service station forecourts. In conjunction with other Cowens equipment including pumps, skimmers, and booms, the OWS makes an excellent emergency deployment unit. 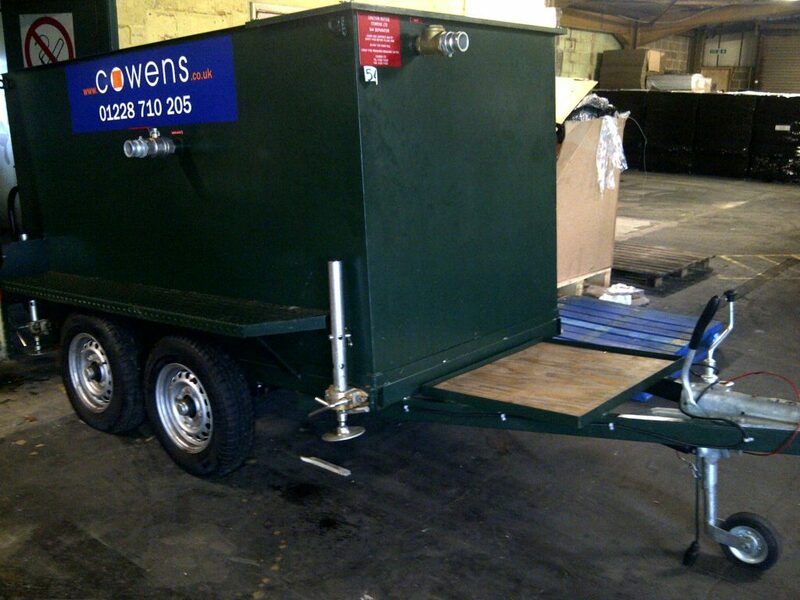 In many cases the trailer can be adapted to suit your particular application. Mobile separators are capable of handling up to 15 m³/hr of oily water. Free oil is taken off through a valved skimmer and, after further built in filtration, clean water may be circulated back into the source. 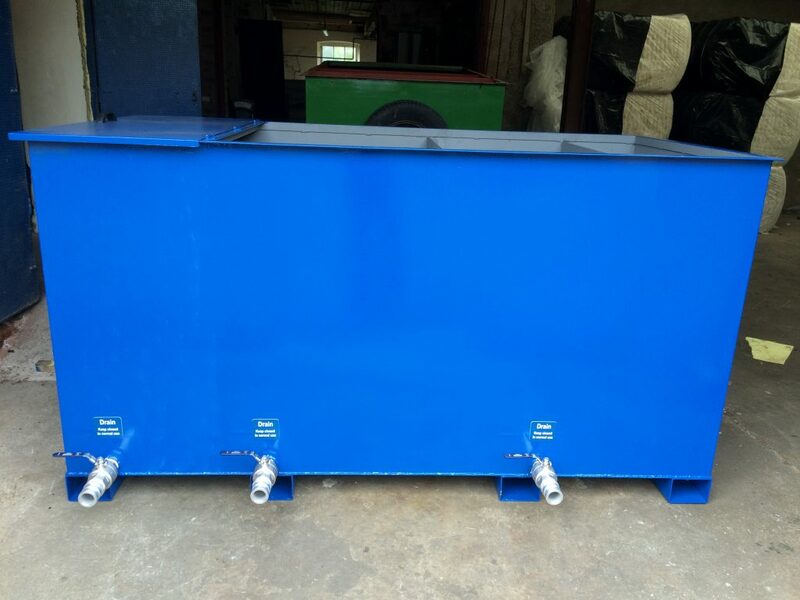 This eliminates the need for expensive transportation of oil and water mixture and allows sale or reuse of recovered oil. Whether the unit is a static or a trailer mounted mobile unit, operational deployment can be completed easily within five minutes. The occasional renewal of the coalescer and filter units is a simple and low cost procedure. 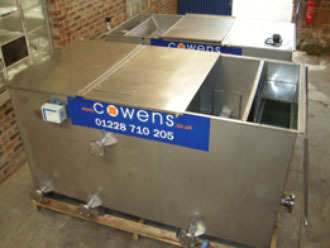 As with all Cowens’ products, rugged construction (needing minimum maintenance) ensures that the OWS is capable of giving many years of trouble free service. Adjustable weir plates on stages 3 & 4 allow fine tuning of level even after the unit is full of liquid. 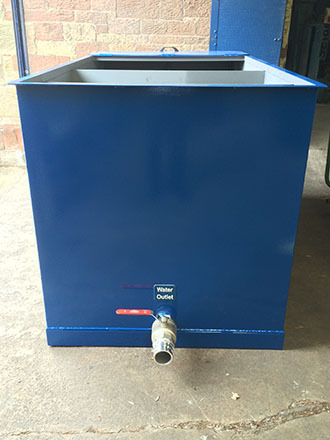 Ball valves and minimum turn pipework allow for easy cleaning of sludges from unit. 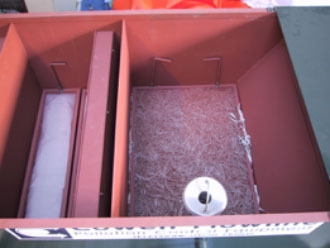 Hinged first stage cover allows for easy access to encourage cleaning of sediment trap. Anti-syphon non-return-valve on unit inlet. Sealing gasket around filter baskets prevents unfiltered flows passing through. Clear engraved identification signs on all valves and pipes. Very well laid out design for easy operation and maintenance. The oil/water mix is pumped into a sludge settling tank to screen debris. The bottom feed principle is used throughout the unit. As the mix flows through the separator, oil is wiered off from coalescing stage 2 into a 2″ outlet for gravity feed into drums. The mixture passes through coalescing filters, where an oleophilic polypropylene filter traps and coalesces the entrained oil. The remaining, almost clean water passes through a filter of Oilsorb-Ultra oil absorbents, finishing with a polishing filter of Oilsorb-Ultra and activated carbon, or, for leaded products, limestone. Clean water exits the unit via a 3″ connector. Fabricated from heavy duty carbon steel plate for long life under arduous conditions. Inside – high performance oil and corrosion resistant alkyd coating. Outside – highly durable alkyd coating. May be finished in your company’s colours if requested. Heavy duty galvanised steel cages incorporating quick-release catches for easy maintenance. Full road going four wheel close coupled unit fitted with auto reversing brakes, heavy duty adjustable load stands and jockey wheel. 12 or 24 volt electrics, fully compliant with current E.C. directives. Mobile, static and custom made variants complete with pump. Units with alternative capacities: Mobile: 5 to 15 m³/hr. Static: 5 to 20 m³/hr. 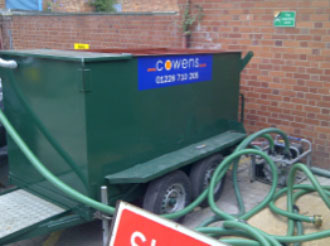 Pumps with capacity and power requirements to suit the site. Top cover for Oil Water Separator. Over all cover for Pump Unit.